Riot Games closed out Season 5 of League of Legends by announcing a new champion: Illaoi. Prepare for me to misspell that name about ten times in this article. Passive: Prophet of an Elder God - Illaoi periodically spawns a tentacle on a nearby wall. Tentacles interact with Illaoi’s abilities and last until killed or left dormant a full minute. Q: Tentacle Smash - Passive: Tentacles that hit enemy champions heal Illaoi for a small portion of her missing health. Active: Illaoi summons a tentacle that slams down in a target direction, damaging all enemies struck. W: Harsh Lesson - Instead of attacking normally, Illaoi charges in for her next basic attack, dealing bonus physical damage before commanding all nearby tentacles to swing at her target. E: Test of Spirit - Illaoi casts a spell that sends tendrils out in a target direction. 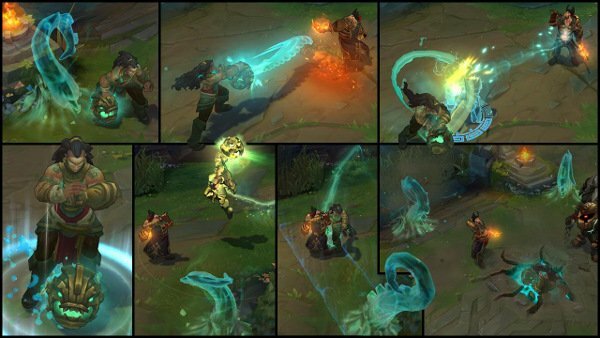 If the tendrils connect with an enemy champion, they grasp the champion’s spirit and tear it back to Illaoi. When spirits are attacked by the Kraken Priestess or her allies, it transmits a portion of its suffering to their now spiritless champion. If Illaoi and her allies are able to destroy the spirit, or if the spiritless champion flees too far from their spirit, they suffer a heavy slow as they become a vessel, and start spawning tentacles around them that attack both their host and their allies. Test of Spirit allows tentacles to occasionally swing at spirits and vessels, dealing physical damage to all enemies hit. R: Leap of Faith - Illaoi leaps into the air before slamming her idol into the ground, damaging all nearby enemies and summoning a tentacle for every enemy champion hit. Harsh Lesson’s cooldown is significantly reduced while Leap of Faith is active. During the laning phase, her tentacles are a double-edged sword. On the one hand, they deal a lot of area of effect damage and could mess up the opposing top laner if they get too close. However, unlike Heimerdinger, she can't just immediately set up new tentacles further down the lane if she pushes toward the enemy turret. While not surrounded by tentacles, she'll be vulnerable to a gank by the enemy jungler. Her ability to lock down an area comes in handy when it's time to take objectives. Test of Spirit and Leap of Faith help her surround the enemy with tentacles. She can then utilize Harsh Lesson to inflict damage on carries or Tentacle Smash to beat up multiple enemies at once. The big challenge for Illaoi is reaching enemies. Champions with a long range or disengage abilities will be a headache for her. If she doesn't land Test of Spirit, it's going to be easy for enemies to kite her. Her ideal teammates are ones that excel at grabbing enemies from afar or can speed her up. Riot didn't announce a release date for Illaoi yet. Right now they're focused on the end of Season 5. They're giving out ranked rewards starting today to everyone who wasn't toxic. The rewards include loading screen borders, summoner icons and more. Today also brings patch 5.22, a patch with several big changes for the pre-season, including a new objective for Summoner's Rift called the Rift Herald and new starting items. Before Season 6 arrives in January, the development team will also add new features like a Ranked Team Builder and a crafting system.